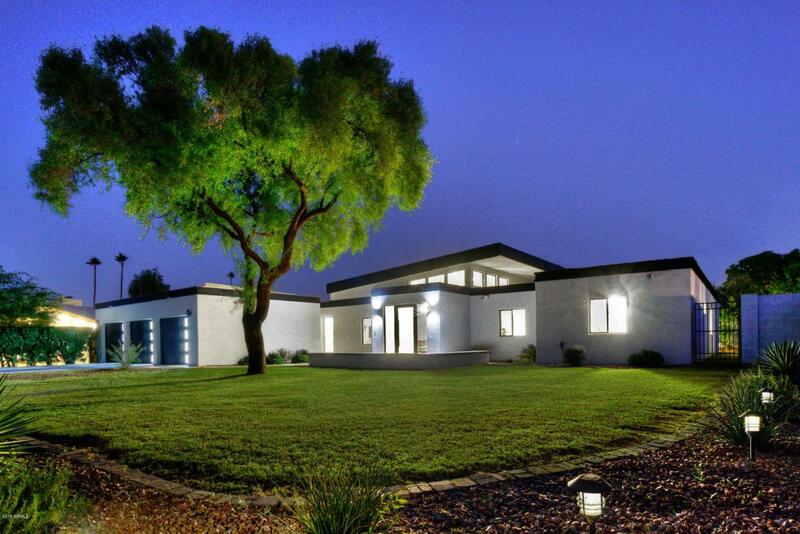 A refreshing mid-century modern 2018 full-remodel and partial rebuild in the highly desirable Arizona Country Club Neighborhood. The developers carefully designed the home with entertaining and space in mind. An architecturally appealing center floating roofline was created to provide soaring ceilings accented with clerestory windows creating expansiveness to the main living areas of the great room and kitchen. The natural light floats from the windows throughout this space connecting the inside to nature. The kitchen is perfect for the chef and entertainer, appointed with spacious quartz counters, gas stove, built in stainless steel wall oven, microwave and refrigerator. The split floorpan allows for a private master retreat while offering the guests their own spacious wing.